Oddly enough, it’s my belief in the sentiment expressed here by Longfellow that underlies my enjoyment of visiting graveyards and cemeteries. When one believes in the immortality of the soul, the sadness or fear often associated with burial grounds is lifted, and the wonder of each human life is seen with sharpened focus. Nowhere is this more true than at Arlington National Cemetery. I did my walking there one beautiful sunny day last week, because I wanted to see the wreaths on display. 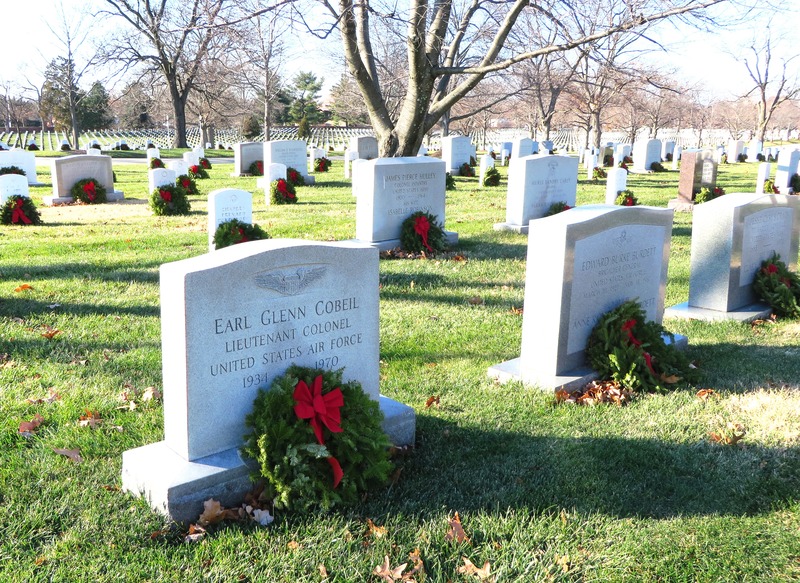 Over 300,000 people are buried at Arlington, and beautiful fresh evergreen wreaths with large red bows adorn most of the graves. This yearly practice is quite an accomplishment. 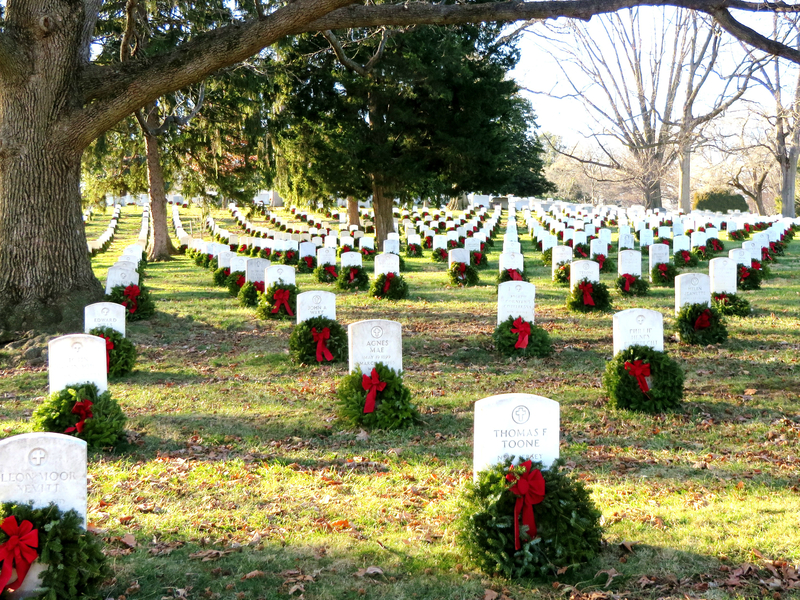 I walked several miles inside Arlington that day and did not see a single headstone without a wreath. Something about the sight of so much evergreen amid the winter landscape is a fitting reminder that death is a universal threshold we all must approach, and we need not fear it. Faith and hope are well represented by the bright red and green amid the subdued winter landscape. 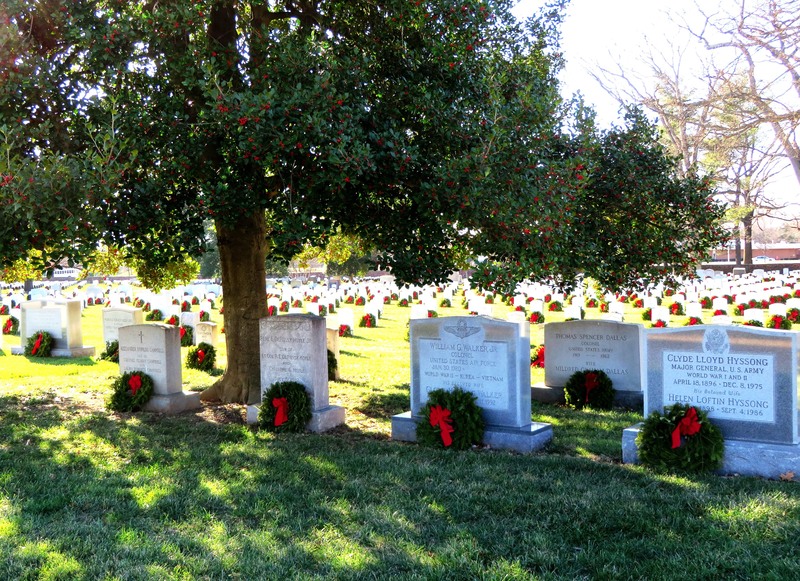 The headstones at Arlington recall the lives of citizens of all ages and stations; those who were born two hundred years ago, and infants who died in recent years; supreme court justices and statesmen, two U. S. Presidents, soldiers of every rank, and their families. Some tell poignant stories, and some give us only the name and life span of the person buried there, leaving the details to our imaginations. The beauty of the hills, trees and quiet pathways, and the monuments stretching as far as the eye can see are a reassuring sight for grieving families, as well as a refreshing break from the clamor of the city for tourists visiting from all over the world. Walking through the well-kept grounds, I was happy that Jeff has decided he wants to be buried there, which will mean that Matt and I, too, will be laid to rest beside him. I hope this doesn’t seem like an odd meditation with which to begin the year. Remembering the brevity of earthly life is a great way to strengthen our resolve to live fully and well for whatever time remains for us. As the old quote says, today is the first day of the rest of our lives. Let’s recognize each day as a real and earnest gift, one we receive with gratitude and celebration. I had the unexpected privilege of seeing an early stage of the “Wreaths Across America” in early December in Maine. It was such a poignant experience, so it is especially meaningful to see your WordPress blog this morning. I’m sure that I can’t fully express my feelings, but they are wrapped up in the symbolism of continuity. Life, death, beginnings, endings, and renewal expressed in the evergreen branches woven into the circle of a wreath. Thank you, Susan, and happy new year to you too! 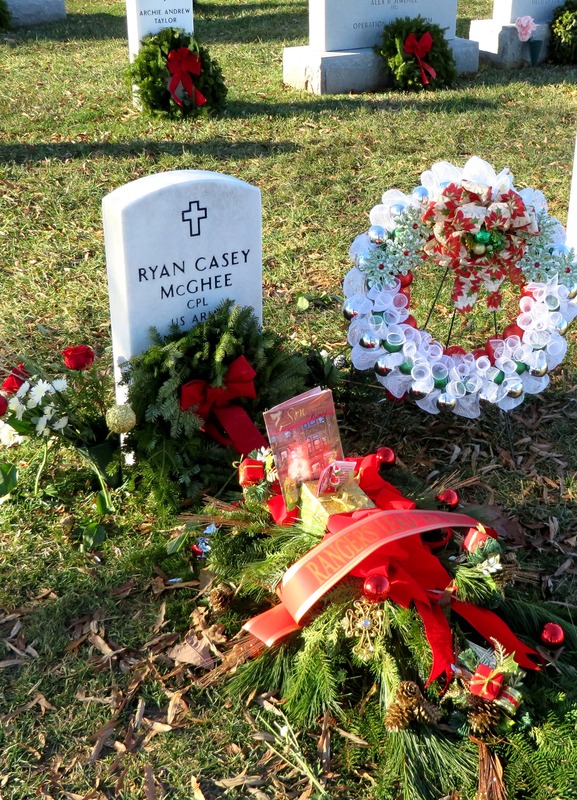 I’m glad you were able to see the wreaths; it’s definitely inspiring and as you say, it’s hard to put the experience into words. I hope you are staying warm and enjoying winter. Thanks for being here! Julia, these days are gifts and within each gift lies a golden treasure if we take the time, and open our eyes and hearts, to see the beauty, to really feel what God has given us! This Monday morning as I heard the cardinal chirping in the holly tree next door, I knew it would only be moments before he came to our porch for his morning drink from Salty’s water bowl. I had just read your words, studied each picture, so the cardinal scenario was even sweeter. Sheila, thanks for telling me about your little red visitor! I love to imagine it drinking from Salty’s bowl in the mornings. When I read your comment I realized I didn’t know how they sound. I went to an online site and listened to their sounds – what fun! One thing I have loved about living in Virginia is seeing the cardinals. They are so beautiful, not just the bright color, but the shape of the head and the dark accents. Our friend Darla has a Christmas tree that is decorated in cardinals each year (as you might imagine, she has several trees and each is different). Today was a good day – fun and productive. If the rest of the week goes as well, I’ll be quite happy. Hope you have a great week too! Sheila, today was at least a ten-cupper for me, and I didn’t even cook (though, as I told Jeff while ago, I am really in the mood to make a big pot of chili sometime soon). I’ve barely ventured outside at all today, though my fitbit tells me that I’ve managed to do 6 miles in the house, with some effort and help from a good rock playlist. 😀 I can smell that stew — YUMMY! Thanks for inviting me into your warm and cozy kitchen. Sheila, I have a Cardinal family in my yard, too! It’s fun to watch the little ones grow, get their colors, and fly each year. Plus the vibrant red male, which stays year-round (with his less obvious but equally beautiful wife) adds some welcome contrast to the otherwise white-washed winter landscape. I have never had the fun of seeing an entire Cardinal family. If I spent more time bird-watching, perhaps I would. I’ve seen more of them here in Virginia than anyplace else, but usually only one at a time. It’s the males I tend to notice most; hard not too, with those bright colors. Yes, they do perk up the winter landscape considerably! Too bad the bright tropical birds are mostly found where they don’t have any snow that needs perking up! But I guess they need to blend in with the landscape for survival reasons, so they thrive among the brightly colored flowers. Hooray that we have at least a few colorful birds this far north. That’s just it, Susan! Isn’t that RED the most vivid and obvious of all colors? The little chirping is also “stand alone” as recognizable among all the zillion outdoor sounds. By the way, I always enjoy your comments. 👏😊 Julia has created quite the ROUND TABLE here hasn’t she? Thanks for the compliment, Sheila — the comments are my favorite part, but of course, it’s the readers and visitors who create that round table! Death is the great equalizer…there is a 100% death rate…nothing is sure in life except death and taxes…no one escapes the hand of death…life is but a vapor. Much has been made of the brevity of life and the surety of death. Does it make me live my life any differently?…I wonder. Anyway, I was intrigued by each of the headstones and realized, as my mother would say, ‘everyone has a story to tell.’ So I looked more closely at what appeared to be the newest marker…that of Cpl. Ryan C. McGhee. By googling his name, I found out that he was a 21 year old Army Ranger killed in Iraq in 2009. He appears to be the only child of his mother, who has created a web page dedicated to his memory. http://for-ryan-from-mom.webs.com (not sure how to make that a clickable link). She placed a card, gift, and wreath blanket there this year…and has seemingly done so each year…oh, how her heart must ache! On the good side, four little baby boys have been named in Ryan’s memory since his death. May he rest in peace. May I live my life a little better today and going forward. Dear Pat, thanks so much for adding this very special comment. When I saw Cpl. McGhee’s grave which was so beautifully decorated, I wondered whether his was one of the very new graves I saw that day, but as I carefully moved aside the flowers to read the inscription, I saw that it had been there several years. I came home and looked up the info on him and found out about his mother (who had left a sweet card at his grave, as you mentioned) and learned a bit more about him. I thought about adding the info to the blog post, but truthfully, I was hoping a reader would notice it and do that for me. Thank you for being the one to help with today’s blog! 😀 Love and a Happy New Year to you and your family! As I visit lost loved ones in a cemetary, I look over the vast numbers of those who have passed. 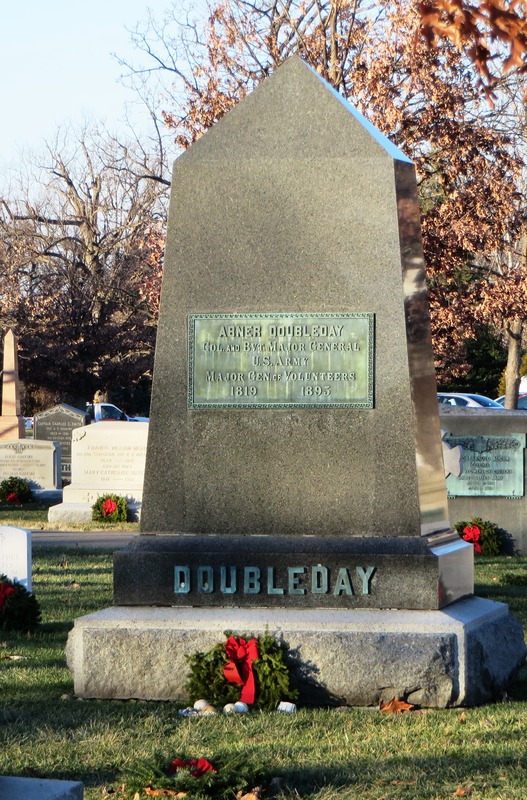 What uniqueness is displayed on their monument stones, that distinguishes one from another, is overshadowed by the one thing we will all have in common. One day we will be in their place. Our hope is that, what they offer us a chance to ponder, is what they have had a chance to accomplish. And that is to understand; It is not what one achieves in life that matters, but rather, how one lived that life. Wow, a mile round trip? Tell Al that. He seems to tire lately of Mom having him continually go check the mail, which is apparently a highlight of Mom’s day nowadays. I’ll have to start sending her some notes here and there. I’m sure Heath would love to be her mail retriever. You just hit the nail on the head! All is based on intelligence and senses. Of which both we are made up. Our intelligence provides us the idea of a thing and our senses its reality. As we come closer to God our intelligence perfects toward that of the angels, who have no need of senses nor reason, because they are above such hinderences. So Paul was right; we do know in part, what we shall know fully, as God already knows us. It is not a biological evolutionary process, but an intellectual spiritual process of perfecting who and what we already are, as God has made us; we need but choose to do His will. And like God, we are not becoming, we are being. Hi Joyce, thanks for your visit and your comment. Yes, Arlington National is certainly one of a kind. Perhaps the most beautiful cemeteries I’ve ever visited are Forest Lawn Glendale (in the L.A. area) which has gorgeous replicas of Michelangelo’s sculptures, and the Valley of the Temples in Oahu, Hawaii, which is surely one of the best-kept secrets on the island; so beautiful that they had to start charging admission to sightseers, because so many tourists were coming. There are sections for the various faiths represented in Hawaii. The Byodo-In is the prettiest feature. Maybe you will find out about someplace in New Jersey that is also very pretty. Joyce, I agree with you; I’m not one who wants to be cremated, though I can see distinct advantages to it. I think my Daddy has said that he wanted to be cremated and have my brothers scatter his ashes from an airplane, but my Mama is against it, so I think they will be buried, as will the three of us, unless we change our minds in whatever time remains to us. It’s one of those decisions that’s not totally logical, but more of something one feels. On a similar note, once before one of Matt’s heart surgeries we were asked whether we would allow him to be an organ donor. I was happy to agree to most of the donor form but couldn’t stand the idea of donating the eyes. That’s totally illogical, I know, but I just couldn’t bear to think of it. Perhaps it’s because there is so much of a person’s spirit to be seen in the eyes (although not so after death). As I said, such things defy logic, perhaps for a good reason unknown to me. Yes, I’ve always found that passage interesting, not least because of the faith involved. It took me awhile to figure out why that particular moment of time was mentioned in the “honor roll” of Hebrews 11, but even from his position of great political power, Joseph obviously knew whence he came, and how history would play out. I would agree. It’s good to go with the gut feeling and not worry about all the logic. It’s what we can live with that counts. Ultimately, God helps us with those ver hard decisions. Yes, and I am SO thankful for that. Would it be irreverent to suggest that some of your father’s ashes could be scattered by plane, as he suggested, and others retained per your mother’s desires? I like to think that when we leave this world, we are no longer bound by time and space, where we are in just one place at a time. Susan, not irreverent at all — but my mother’s objection was to the cremation itself, not to the scattering of ashes. I agree, I believe that after death we will not be bound by time or space in the sense that we are now. Which means, to me, that the afterlife not a place in the sense that we think of “place” now, but another dimension, as well as a different state of being. Although it’s hard for us to think about it that way; we tend to default to the evidence of our five physical senses. I think that’s why there is so much allegory in Biblical depictions of the afterlife. There really are no human equivalents. Now that I’ve lived alone for more than ten years again I look at graveyards with envy. I know most would consider that wrong but I’m being honest here. I wish that I could somehow take the place of a terminally ill youngster who will be taken before their time but then I must remind myself that it’s God’s call when our time is up. He still has work for me to do. Bob, I think that there are many people who feel as you do. A long life is a mixed blessing, if nothing else because of all the goodbyes to be endured with loved ones lost during the years. I’m touched at your wish to switch places with another but I know you agree with me that we need to stick to the divine timetable. Your thoughts remind me of the words of Paul in Philippians 1:22-25. Thank U so much for this tribute. 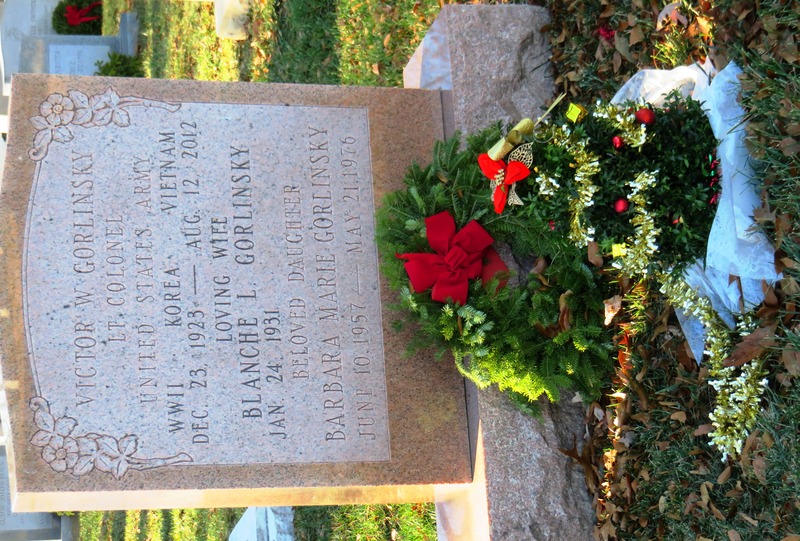 My parents are buried there and grandparents are buried in Getteysburg. .
Carol, thanks so much for your visit and your comment. I’m so happy you liked the tribute! I’m happy your parents are buried in such a beautiful place. I hope to see Gettysburg someday. 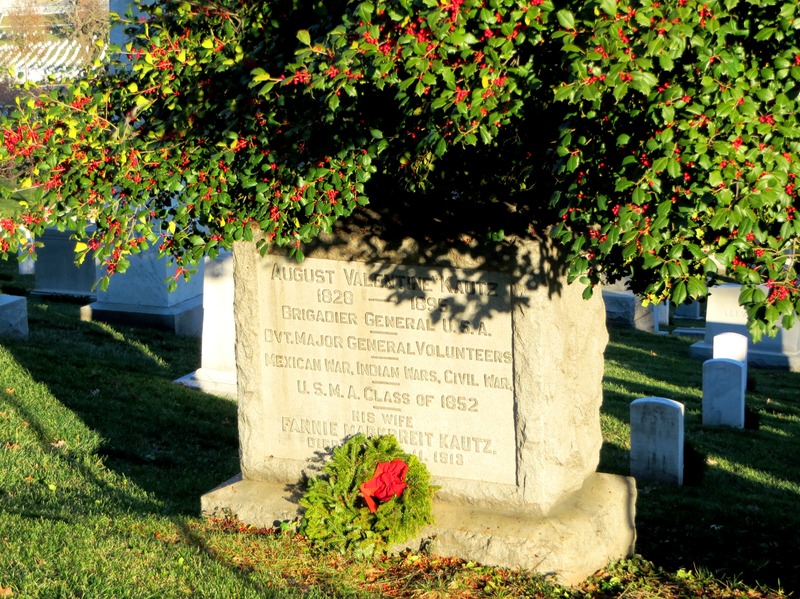 Placing a wreath at every headstone truly is an amazing accomplishment. Bravo to those involved. Somehow, for me, the visual impact really hits home when you see all those wreaths. So many sacrifices. Seems so different than when you look out past rows and rows of bare headstones. Maybe because green reminds me of living and growing? I have always felt calm in cemeteries. Our family home was across the road from a very large one. Dad would go there to walk up and down the roads and walk our dog Rambo. Sometimes, if I was home, I could join with. Now that’s where I visit dad. All the tree’s are so much bigger and it’s a reminder that time goes by quickly and nothing stays the same for long, even if you’d like it too. I actually learned to drive our family car there. Left turn, right turn, park here, pull up there. LOL! Kind of weird now that I think about it but seemed normal to us because we lived across the road. Wow, K, this is a fascinating glimpse into your life. Learning to drive in a cemetery is great! I don’t think I know anyone else who had that experience. If I had been your Dad I would have been saying “Remember, if you drive crazy, you will end up back here PERMANENTLY.” 😀 I have always been so petrified of car accidents; it’s a wonder Drew survived his learn-to-drive years. I’m so glad Jeff was there to handle most of it. Jim sounds like Jeff re: his reaction to your plans. I keep reminding Jeff that he might outlive me (after all, none of us is promised tomorrow), but he doesn’t seem to take the idea seriously. I love your plans for a showing of your work, which captures so much of your personality. I also think the bench is such a great idea. A practical way to leave a memorial while providing hospitality for people who stroll by. When out and about, it’s so refreshing to come upon a place to sit and rest. I’ve become much more aware of that when traveling with people who are facing some sort of medical issue, but still need and want to get out. Also, as I get older, I find I need these rest spots more and more. The world would be a friendlier place with more benches! We have several neighbors who have inviting benches in their yards and gardens, in both our York and Alexandria neighborhoods, and though I never take the time to have a seat (and probably would feel a bit intrusive doing so) it somehow sends a message of “Welcome! Feel free to sit and rest” whenever I walk by. You hit my Hawaii button with the bit on Valley of the Temples. We lived about two miles down the road from the temple in Kaneohe. We had a tour there with our C.P.E. class and we used to go out to the monthly jazz concerts they would have there with Miyoko M- who was the host and would often sing with the various groups there. One of the things that struck me about the temple was seeing all the Buddhist headstones lined up in perfect symmetry facing East? Fun to see Joyce’s post here. I seem to have mentioned that Joyce and I were classmates in our CPE class two summers ago at St. Luke’s in East Harlem. Joyce is a very soulful person and just this month- was ordained into the Episcopal priesthood. Joyce please correct if I have the dates wrong. I hope to see her when we make our trip out in early May. Michael, I never tired of going to the Valley of the Temples. My kids used to love it when the caretaker was there and let them ring that big gong. It was quite a drive, but always worth it to go out toward Kaneohe on the LikeLike (or was it the Pali? or maybe either?) highway. It was such a thrill to crest that first hill that gave the breathtaking view of Kaneohe Bay. Yes, you had mentioned here about knowing Joyce – I think that is so cool. Cyberspace does make the world smaller in some ways. I hope you are able to see her in May. Thanks to both of you for being here! Hi Michael, Dates were correct. I was ordained on January 10, 2015. I look forward to seeing you in May. Hi Joyce, Congratulations on your one-year anniversary! Thanks for being here. I see that on January 24th they are having the jazz peace concert with Miyoko M at Biyodo Temple. Actually I think it was just this month for Joyce’s ordination. It was like a potluck-the concert – and jazz aficionados from around the Island would come out. I remember one of the caretakers at Biyodo telling me they liked having the jazz musicians out because the souls who were interned there liked the music and to see others enjoying the concert. Such a soulful place is Hawaii. I have a bumper sticker on my care back bumper, “I love Kaneohe.” I got this at the big church- in Kaneohe- Hope city? As far as cremation goes I am undecided, but it seems many in my family have been leaning this way. I was persuaded by someone saying that surely saints such as Joan of Arch who were in a sense -“cremated,” surely these folks are included in those who sit at the throne of God. My wife’s family has a plot in a famous Seattle cemetery-Lakeridge. This is where Bruce Lee and many of the founding fathers and mothers of Seattle are buried like Dexter Horton and Princess Angeline who was a “wet nurse” for one of my wife’s relatives; her great aunt I believe. Princess Angeline was a member of the Duwamish tribe and I believe a documentary was made about her life. Now you have me thinking about the famous, ” Lady in Black” who haunts the confederate cemetery in Marietta. Apparently she is still seen from time to time, dressed from head to toe in black mourning for her sister and brother. Michael, I think most people who oppose cremation do so simply from a gut reaction against it, not from any religious objections. As I said, I can see where it might be quite practical. I’m just too accustomed to the burial traditions I grew up with. I haven’t heard of the “Lady in Black” but it sounds like a fascinating legend! Of course I grew up with the classic urban legend of the haunted hitchhiker on Peachtree Street, which in some iterations is supposed to be Margaret Mitchell. Folk tales are fascinating! Someone I know might say I digressed a bit in that last post. Yes, but that’s what we do here! I wasn’t kidding when I said someone should start a blog called “we digress” in which anything and everything was discussed, completely randomly. NPR had a nice bit about Margarett and how after she was injured and cooped up in her apartment her husband encouraged her to write” something,” while recuperating. She was a reporter for the Atlanta journal and broke her leg in a car accident? Anyway, she was up there a while and wrote a little book that became quite famous. I got the movie last Christmas and watched it New Years day. She did do a fair bit of rewriting I think.